Starting the new year off right with several requested updates and enhancements like...Fresh digital certificate redesign with multi-device support; Evergreen certificate urls for easy customer printing and reference; Certificate #'s added in Stripe for easy payment reference; Australia date format support on certificates. Creating a limited time offer, like a Groupon, to help drive sales is now easier than ever with our new deal templates feature. Select a Deal Template similar to what you want and then edit as needed! This is a quick way to get you started with the most common deal types that most businesses use to help boost sales when needed. 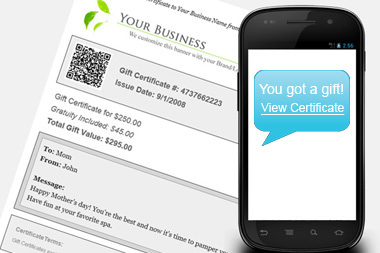 Validate and redeem certificates via text message! It doesn't get any easier than sending a simple text message to look up a certificate balance and redeem. No login or app to install. Just register your mobile number in your account to get started. We are now integrated with Square as a payment processor! Square works with all types of businesses and provides the tools you need to start, run and grow. It’s easy to get started- there are no monthly fees or long-term commitments. Accept payments online and pay one flat rate per transaction. This option is currently only available to US businesses. We are excited to launch our FREE companion app for your account with TheGiftCardCafe.com. 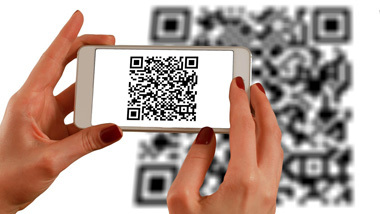 Use this app to easily scan the codes on your gift certificates for fast validation and easy redemption. Available now in Google Play Store and Apple App Store. 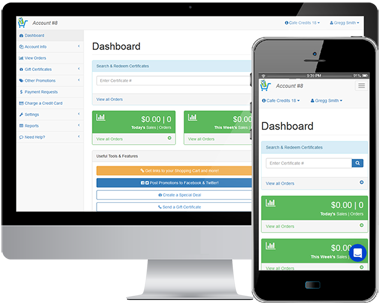 We are excited to launch the newly designed Merchant Dashboard which gives business owners easy access to all system features and functions on all devices. Now that the BIG gift giving season is finally here we are excited to release, probably, the last new feature of the year! Our system offers many different discount and promotional features but this one is so simple and useful that we almost overlooked it. You can now easily enable a "flash" sale for specific package/service gift certificates with just a few clicks. We have made Special Deals easier for Restaurants, and others, to manage in their own POS. Just like Groupon, you can now easily import a list of your POS certificate numbers to be included with each deal certificate. Like all features in our system, you are in full control so you can import and manage your custom deal numbers on the fly with ease giving you freedom to launch new deals when you want...nights, weekend, and holidays. 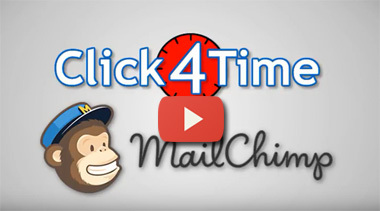 Click4Time Appointment Booking Software just released another great video showing how easy it is to integrate TheGiftCardCafe.com with your Click4Time Online Appointment Booking Calendar. 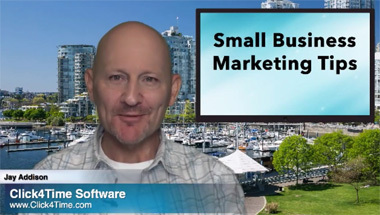 They also show step by step how to use our Special Deals feature and their integration with Mail Chimp to generate more revenue for your business. Prefect for Mother's Day! Add a Make a Payment button to your website so your clients can easily make online payments to pre-pay for services or for whatever reason. Create custom Payment Requests (like a digital invoice) that you can quickly send via text or email to a client so they can pay online for services or for whatever reason. Click4Time Appointment Booking Software put together another great way to help you grow your business and reach new clients, it's marketing 101 for health care industries including massage therapy, massage therapists, physiotherapists, chiropractors, and other healing modalities. This video also shows how TheGiftCardCafe.com and Click4Time.com work perfectly together to help your business increase sales. 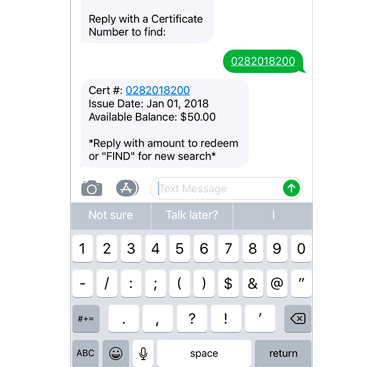 We just launched the ability for your customers to send instant gift certificates via Text Message in addition to the standard email or print options! 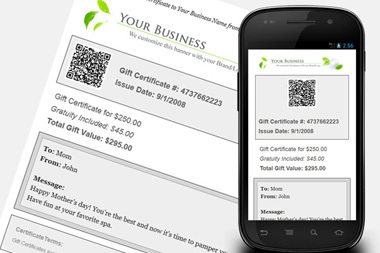 This feature gives your business a competitive edge over the competition by allowing your customers to choose the way they want to send & receive gift certificates. Sending a text certificate ensures delivery and is a great alternative or backup to email since most people always have their phone handy. Flat dollar amount discounts have been added to both the general discount and promo code features. For example, create a Promo Code to give "$15 off when you buy $100 or more". This new addition along with standard percentage discounts, percentage promo codes, BOGO, and Special Deals fully rounds out our suite of promotional discount features allowing you to offer just about any offer you can dream up. We recently launched our newly designed instant certificates! Now, like the rest of our system, our instant gift certificates are fully responsive which allows for an optimal viewing experience across a wide range of devices from mobile phones, to tablets, to desktop computers. This is a critical feature today due to the fast growing percentage of customers that keep the certificates are their phone rather than printing out to be redeemed. We now support Stripe as a payment processor! Stripe offers the same, if not more, professional merchant account features as other leading processors but with NO monthly fees and competitive processing rates. Knowing that 30%, and growing, of online shoppers are using mobile devices we just launched our new Responsive Design shopping cart system. With Responsive Design we provide your customers with an optimal viewing & shopping experience across a wide range of devices. Your customers can now purchase with ease from mobile phones, to tablets, to desktop computers. The January/February issue of Massage & Bodywork magazine just named TheGiftCardCafe.com #5 in their Top Ten Tips to "Take Your Practice to the Next Level". Be sure to checkout the latest issue. We now offer multiple options for integrating Online Scheduling with our new partner. We make it easy to add online scheduling to your instant gift certificates via Click4Time. 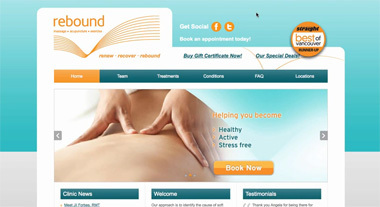 You can also add instant gift certificates to your Click4Time booking pages to help boost your online gift sales. We just launched our NEW and easier to use Official Facebook app that helps you cash in on the power of Facebook. 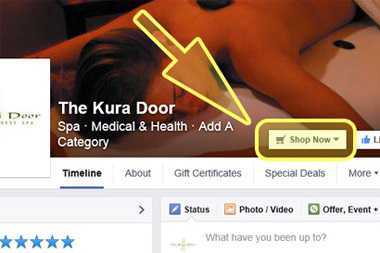 With just a few clicks you can add a Buy Now Gift Certificate page and a Special Deals page to your business's Facebook page. That's FREE advertising. 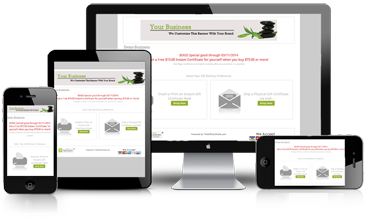 The Associated Bodywork & Massage Professionals include adding the TheGiftCardCafe.com system as one of the tips in their "Start the Year Out Right with a First-rate Website" campaign to ABMP members. 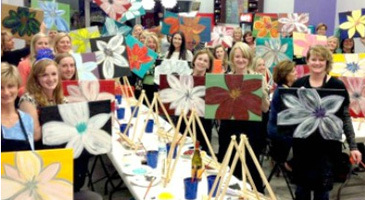 We couldn't think of a better way for business owners to start the New Year! Our Instant Gift Certificate & Special Daily Deal platform now supports Australian businesses...another shrimp on the barbie! Our Instant Gift Certificate & Special Daily Deal platform now supports Canadian businesses. 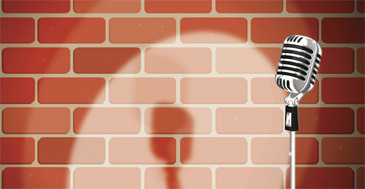 BookFresh guest blog by Gregg Gottschling, co-founder TheGiftCardCafe.com, on Website Analytics and Why It’s Important. Article no longer available - BookFresh acquired by Square in 2014.